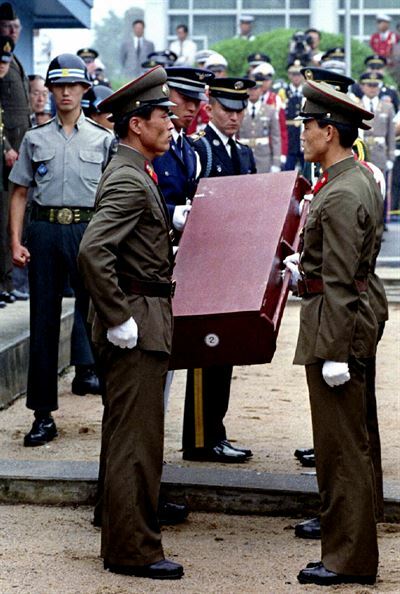 The U.S. military plans to send 215 empty caskets to North Korea via the inter-Korean border on Saturday to get back the remains of American soldiers killed during the Korean War, a South Korean military official said. About 30 U.S. Forces Korea (USFK) vehicles carrying the caskets were scheduled to depart from the Camp Humphreys base in Pyeongtaek for the border village of Panmunjom on Saturday afternoon, the official said on condition of anonymity. "North Korea will repatriate the remains in the caskets," the official said. Recovering and repatriating the remains of U.S. troops killed during the 1950-53 war was one of the agreements that U.S. President Donald Trump and North Korean leader Kim Jong-un reached during their historic summit in Singapore earlier this month. The North is expected to hand over the remains in the coming days. The delivery of the caskets shows that the implementation of the summit agreement is going well. Coupled with a recent decision by the U.S. and South Korea to suspend their joint military exercises, the repatriation of the remains is expected to have positive impacts on the upcoming denuclearization negotiations between the two sides. Speculation has arisen that a high-level U.S. official could visit the North to bring the remains home. Should Secretary of State Mike Pompeo visit Pyongyang for denuclearization talks, he could take the remains with him on the way back home. It is unclear how the remains will be transported.